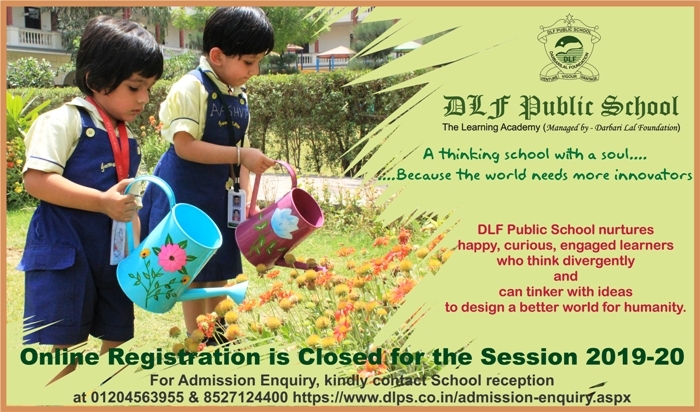 DLF - A School With A Soul ! Each Child Is A Star, And Each Must Twinkle ! Where We Create Success Stories ! ✦ Please note that Fri, April 19, 2019 will be a holiday on account of Good Friday. Admin Office will remain open. ✦ Please note that Wed, Apr 17, 2019 will be a Holiday for all Classes on account of Mahavir Jayanti. Admin office will remain open. ✦ Please note that the school will remain closed on Saturday, April 13, 2019 on account of Ram Navmi. ✦ School will remain closed for all classes from Apr 9 to Apr 11,2019 on account of Lok Sabha Elections. Admin office will remain open on Apr 9 and Apr 10, 2019. DLF Public School Daily announcements broadcast for All School Students, Parents and Staff.